We are here to make our customers happy, not to shake every last penny out of their pockets! Not the one with the best profit margin! When new products come out we will sometimes sell them at a discount in order to get honest feedback from our customers. We believe our customers more than sales pitches or online reviews. Many of the products we sell have been road-tested by our staff. Whenever possible, we ride what we sell. With more than 100 years of riding experience between us, we’ve amassed a lot of product knowledge! If a customer comes in and inquires about a product and we do not believe that they will actually benefit from that product, we will tell them so. Find motorcycle parts, accessories, apparel gear luggage and more. We have a wide variety of custom and replacement parts in stock. 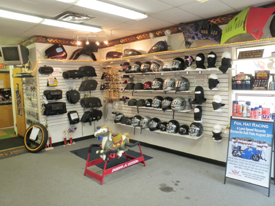 Our inventory includes batteries cables lines tires and the things you need to keep your motorcycle on the road. What we don't have here in the store we have real time inventory access to most major brands and manufacturers through our distributer network and in most cases can have the parts you need next day. OEM "original equipment manufactured" parts from Yamaha, Honda, Suzuki, Kawasaki, Harley Davidson, BMW, Triumph, Victory, Ducati, Aprilia from our well established motorcycle dealer network. Our staff will be happy to help you find the parts and accessories you want. If we don't stock it we will go out of our way to find it for you. If it has anything to do with power sports or motorcycles we will put our resources to work for you to achieve the style and performance desired with quality and dependability in mind. Find motorcycle parts, accessories, performance, apparel and gear. 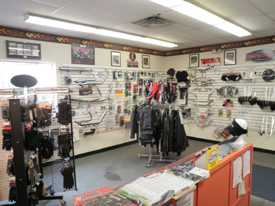 We have a wide variety of custom and motorcycle parts and accessories. Our inventory includes service parts and motorcycle accessories for all types of riders and access to most major brands and manufacturers.